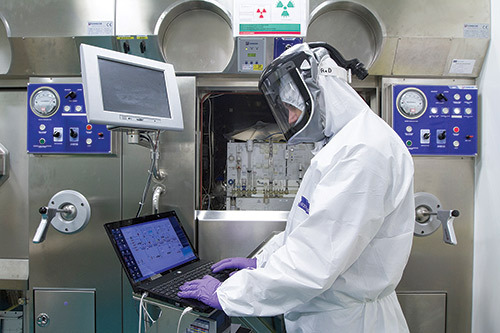 AAA currently has 17 production and research and development facilities that manufacture both diagnostic and therapeutic molecular nuclear medicine products. Advanced Accelerator Applications (AAA) is pioneering work in theragnostics—the blending of therapeutics and diagnostics capabilities into one drug for nuclear medicine applications. “Theragnostics is a very straightforward proposition for physicians dealing with nuclear medicine,” says Stefano Buono, AAA’s CEO and founder. This approach attaches radioisotopes to therapeutic molecules to deliver therapeutics and imaging in one injection. “The isotopes don’t change the nature of the chemical entity, and they don’t change the ability for targeting,” he explains. Traditionally, most radioactive compounds used in healthcare are active about 10 hours. AAA has produced more than 30,000 batches of such compounds for medical centers since spinning out of CERN in 2002. The company has expanded its work to include therapeutic compounds. “We can make therapeutic, radioactive compounds that have a three-day window,” Buono asserts. Unlike traditional nuclear medicine approaches, which can’t treat metastatic disease, theragnostics is effective for tumors that are so widespread they can’t be treated with radiotherapy or surgery.